As governments face new types of challenges, from higher expectations of citizens regarding quality and efficiency, integrating new technologies in administrative processes as well as a higher degree of participation, to the extent of co-creating solutions, the digital transformation has no way of being successful unless is being built on collaboration and partnership. But the digital transition of public services varies significantly from one country to another and even from one city to another. In Romania, a national strategy for digital development has been created: the National Strategy on the Digital Agenda for Romania 2020. Unfortunately, the country is listed as the last out of the 28 EU Member States for digital development according to the Digital Economy and Society index. But this does not mean that Romania has been stagnant in terms of digital public services. In Romania, digital public services have mostly been developed at the central level, and they relate to matters all citizens use in the same way, such as tax payment, social assistance, public auctions and visualization of national statistics. 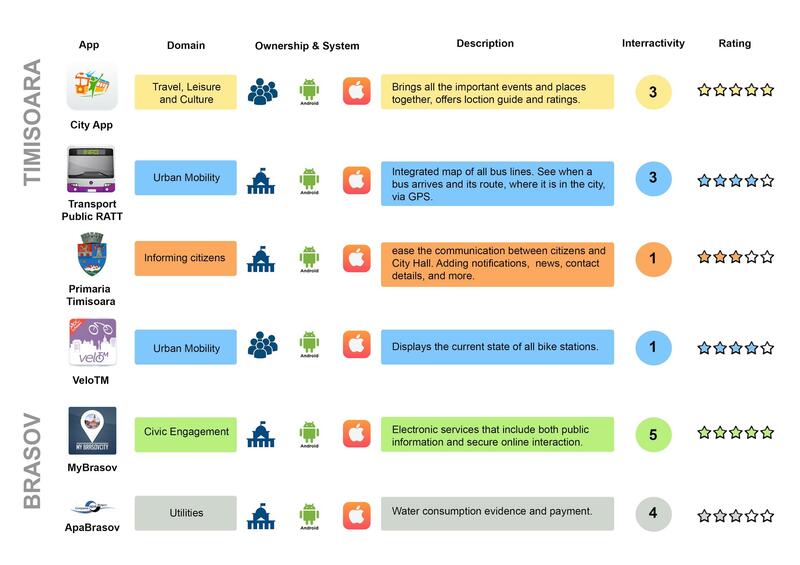 At the local level, some useful applications have been developed, but they mostly cover the travel and leisure sector. Some municipalities have even committed to developing online services for requesting or submitting documents on their webpages or created mobile apps that encourage civic engagement, although no active forms of interactive e-governance are practiced. According to Romania’s Territorial Development Strategy, apart from the capital Bucharest, 20 cities have been identified as engines of competitiveness, of which seven, the biggest cities, are named growth poles: Cluj-Napoca, Iași, Brașov, Ploiești, Timișoara, Craiova and Constanța. The other 13 cities, relatively smaller in size, are categorized as development poles: Sibiu, Târgu Mureș, Brăila, Galați, Bacău, Suceava, Pitești, Râmnicu Vâlcea, Deva, Arad, Baia Mare, Satu Mare and Oradea. Although these cities are allocated more funds from European and national sources, have more technical resources and administrative capacity, mapping their digital development leads to rather surprising findings. 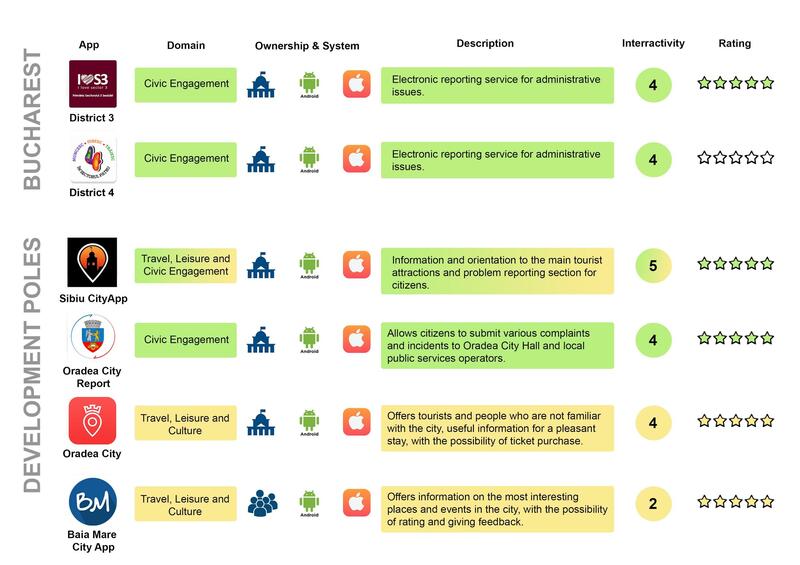 Through online research, 29 functioning and used applications for digital public services have been identified. 21 have been developed by public administrations and the remaining 8 by civil society or other stakeholders, but they all serve the purpose of helping the citizen in the relationship with the municipality and their services. 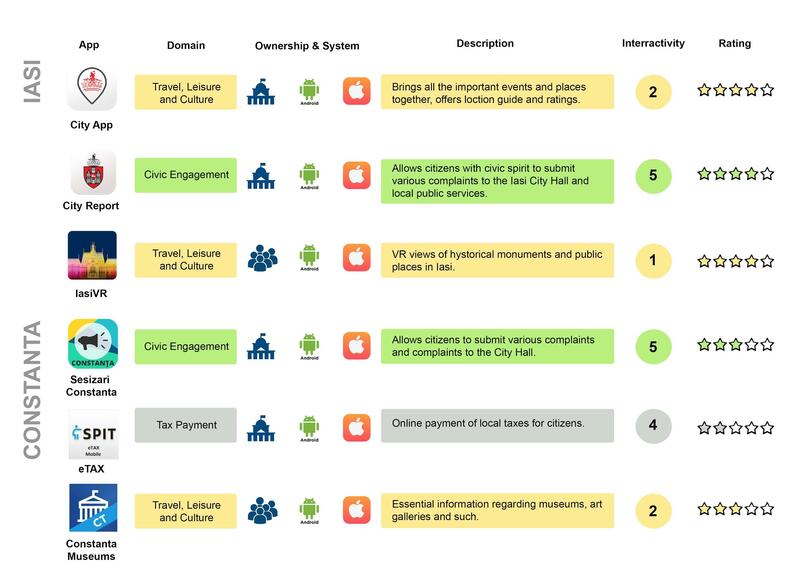 Most applications are travel, leisure and culture-related, and only some of them have some for of civic engagement element for the locals through problem reporting modules. Usually, the public administrations have committed to monitor and respond to the issues reported through the apps. 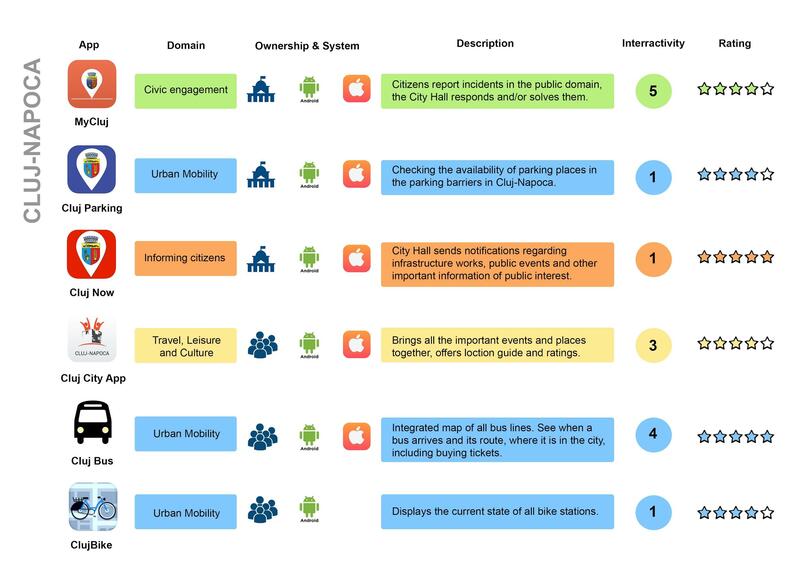 Cluj-Napoca is leading the digital transition of public services with 6 operational apps – 3 owned by the City Hall in the fields of civic engagement, informing citizens and urban mobility. The other two are urban mobility applications for the purpose of public transport and alternative transport (bicycles) and one tourism application have been developed by other stakeholders with a civic spirit. The second growth pole leading digital transition is Timisoara, with 4 apps: two were created by the public administration for the purpose of informing citizens and urban mobility – the transport company has an app for monitoring buses in traffic and creating public transport routes, and two apps were developed by other stakeholders regarding urban mobility (biking), travel and leisure. Unfortunately, no civic engagement applications have been developed in Timișoara, but prospects are high as the city will be the European cultural capital in 2021. Next in line are Iași and Constanța, both with civic engagement apps with a high degree of interactivity developed by the public administrations. The Iași Municipality also has an official travel and leisure app, while Constanța has an official tax payment app, which unfortunately has been given a low rating by citizens. Both cities have interesting civic tech apps in the field of travel and leisure, Iași for the VR visualization of public spaces and historical monuments and Constanța has an app dedicated for museums. Out of the 9 growth poles, the only other city besides the ones mentioned above where the public administration has developed two sucessful apps is Brasov: one for civic engagement and one for water consumption and evidence. The other two cities from the list of 9, Craiova and Ploiești, have taken no steps towards the digitalization of public services. Bucharest, the capital, does not rank first in terms of the number and types of apps as it would be normally expected. 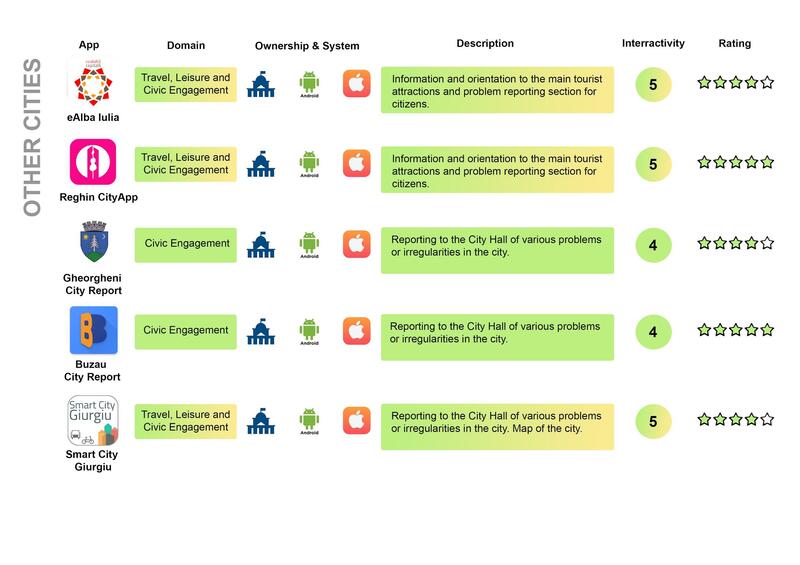 Only two districts (3 and 4) have developed civic engagement apps, while the City Hall has no participatory digital public services. Next in the ranking are the 13 development poles. In 10 of them, no such applications have been developed. However, 3 cities – Oradea, Sibiu and Baia Mare – are currently engaged in the digital transformation with quality, high rated and highly interactive apps. The lead is taken by Oradea, with two public apps, one for civic engagement and one for travel and leisure purposes, followed by Sibiu, with an app that combines both. Next, Baia Mare, has an app developed by other stakeholders (it was not described as being official), which, as well, serves touristic activities. Given the fact that most of the development poles and even a couple of growth poles didn’t manage to engage in digital and interactive public services, a few other smaller cities did, through political will and commitment. These are Alba Iulia, Reghin, Gheorgheni, Buzău and Giurgiu, which all have developed apps with both leisure and civic engagement components. 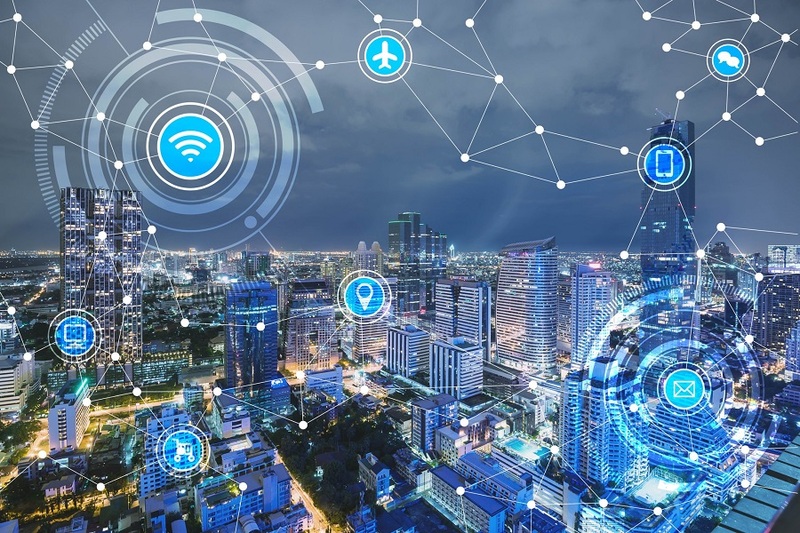 Moreover, Alba Iulia is the first Romanian city where the concept of smart city is being tested by the Ministry of Communications and Information Society. This project, launched in 2016 and projected to finish in 2018, will be based on the development of public-private partnerships that will lead to the integration of value chains in various sectors of activity at the local and regional level. 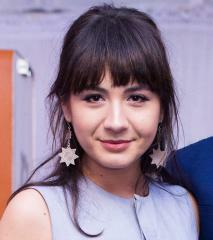 Andreea Maier is an urban planner, working in the field of strategic planning and social development. So far, she has been involved in elaborating over 10 development strategies at municipal, metropolitan and county level. Being passionate about the dynamics of planning and, implicitly, the catalytic factors within it, Andreea wants to develop products and good practices to improve the process of governance and territorial cooperation with the help of technology.